All things come full circle, and C.J. 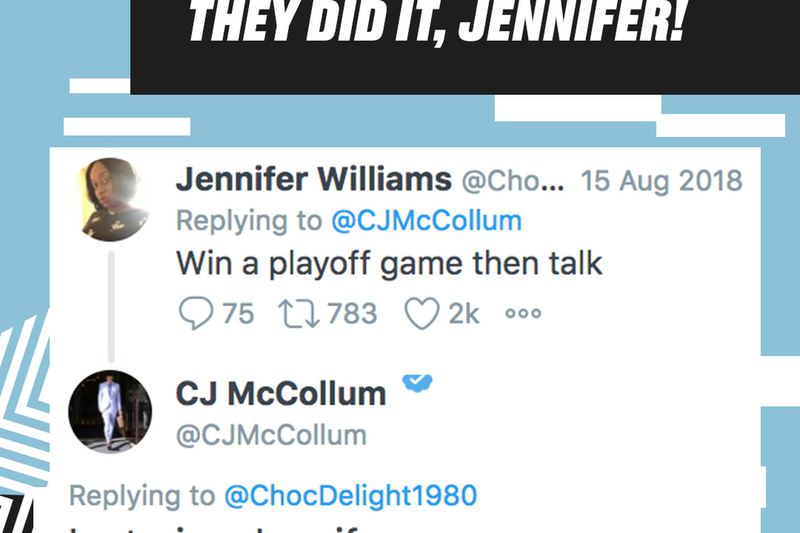 McCollum was hilariously reminded of that when the Portland Trail Blazers secured their first playoff victory since 2016. He told Jennifer he was going to try to do this. — NBA TV (@NBATV) April 14, 2019 Remember how this whole thing happened? He wrote that the Warriors were one of the best teams ever assembled — a fact — with four Hall of Fame players and another on the way (Demarcus Cousins) — another fact. The thing is, though, Portland had just gotten swept in back-to-back playoff series: first in 2016 by the Warriors (which, understandable), then embarrassingly by the New Orleans Pelicans in 2017 (which, inexplicable). It instantly became the next great NBA meme. It was a t-shirt. Plenty of folks asked and my guy @GrantGoldberg delivered! How many of you would be interested in snagging one of these t-shirts? It took over social media. That’s why McCollum got a deep, hearty laugh out of the question. Jennifer was a legend, even if it was just for a single tweet. C.J. tried, and he did. And now, Jennifer says she has fans from all types of NBA fanbases asking for her help. She has a new name now: the playoff whisperer.